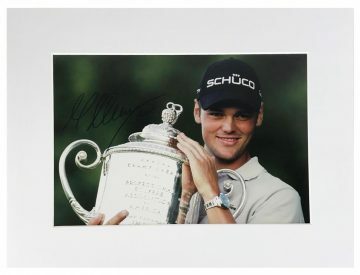 Shop signed Martin Kaymer golf memorabilia, autographed photographs and golf related items from the German star. 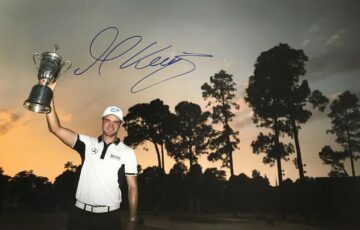 Signed Martin Kaymer golf clubs, caps, gloves and photos – all with free UK delivery, fast international shipping and Certificate of Authenticity, most with signing proof! 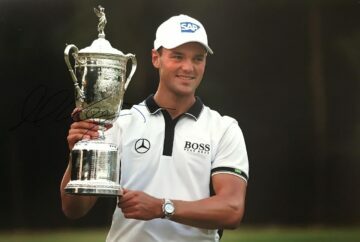 Pro golf champion and former world number one Martin Kaymer is one of the sport’s most respected young players. 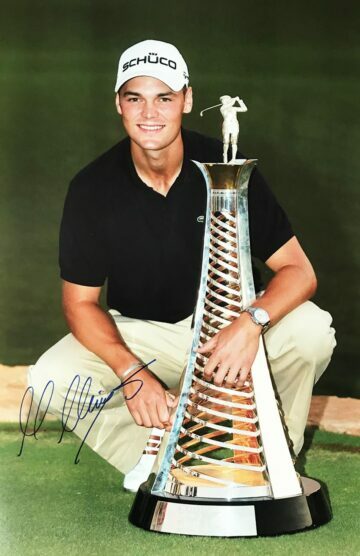 Born in Dusseldorf, Germany in 1984, Kaymer started playing golf at a young age, picking up his very first win at the age of 20 as an amateur. His career continued to gather pace until 2007, when he made his professional debut. He made the first cut of the season at the Singapore Masters, in which he finished 20th. From there he continued to make the cut for a variety of European events, charting more top 20 results as the year went on. 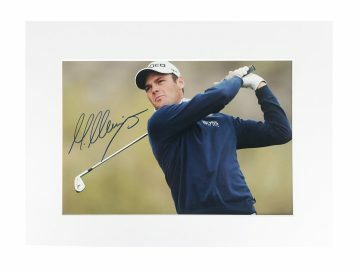 By the end of 2007 he had finished as the highest ranked rookie in golf’s prestigious Order of Merit and was handed the Sir Henry Cotton Rookie of the Year Award. During this time he also entered the Official World Golf Ranking for the first time ranking within the top 75, making him the highest-ranked German golfer. This was a taster of what was to come for Kaymer. 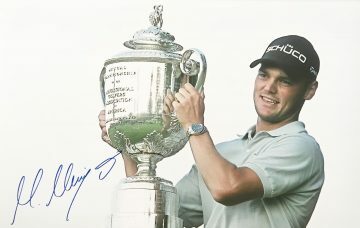 During the 2008-2009 season he kicked off with a bang, winning his maiden tour event at the Abu Dhabi Golf Championship. As he did so he rose through the ranks to number 34 – making him the only player in the top 50 under the age of 25. More career wins followed until his remarkable PGA Championship win in 2010, in which he defeated Bubba Watson during a tense aggregate playoff. He followed it up in 2011 with his first WGC win – and a subsequent ranking of world number one. Championship and US Open. He also has three prestigious awards to his name including European Tour Golfer of the Year, which he won in 2010. 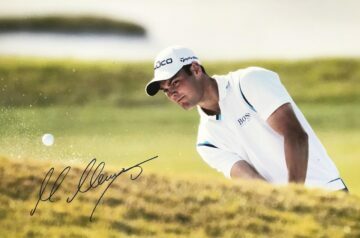 Here at Firma Stella you’ll find a fantastic selection of Martin Kaymer signed golf clubs, caps, gloves & photographs. Commemorate one of the sport’s youngest star players with exclusive items autographed by the man himself. Each item is supplied with a certificate of authenticity for peace of mind.